My friend Cath Young started her second handmade business – My Bearded Pigeon – in late 2009, and has sold almost 6,000 of her designs on Etsy alone in this time. She has been an Etsy featured seller and is also on the Etsy Seller Advisory Board this year. I invited her on the show because I’ve known her online since before she started MBP – and I’ve been watching her business grow since the beginning. She’s a fabulous example of someone who ‘learnt the ropes’ via her first biz, and then knocked it out of the park with her second one – applying all the lessons she learnt first time around to launch a new – and fresh – idea to the world that took hold quickly – with the help of some fortuitous PR driven by a now famous photo! Cath is also a mum to 2 kids, still works part-time as a social worker outside of her biz (because she loves her work), and is as down-to-earth as you can get – not to mention hilarious – we laugh a lot in this one! Cath started her journey with her blog back in 2007 and loved the community feel that came with it. When Cath’s daughter was born she started sewing as she had trouble finding really good quality clothing for girls. 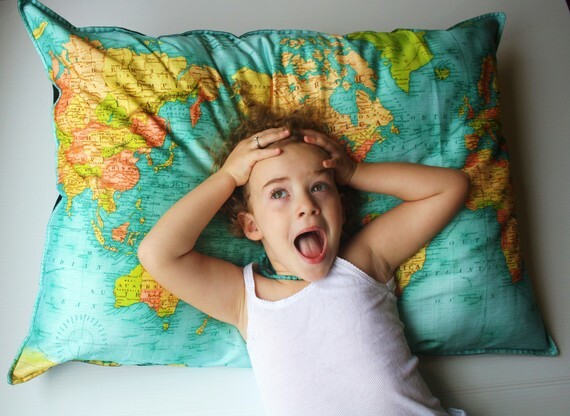 This evolved over time to homewares and came up with her idea for map cushions. Cath decided that the new line of homewares needed a new name so she started a new brand: My Bearded Pigeon. The above photo was one of hundreds and Cath knew it was the one to use to market her homewares. Within weeks of this photo being published it was featured on Apartment Therapy, which was a huge boost to her new business. Cath had an onslaught of orders following this and had hundreds of orders to fill, as well as custom orders for other maps. In 2011 the head stylist at Real Living Magazine contacted Cath and has been featured multiple times, including on the cover. Cath has been approached regarding her price point but she held firm and made sure she let people know the benefits of buying quality handmade and ethical products. Cath still works outside of her business and enjoys the contrast of doing both. My Bearded Pigeon is a great example of a business that is succeeding because of great PR. No day is the same for Cath but that is the way she likes it. She likes not being on the same schedule day in and day out. With magazines they will want you to work quickly so Cath learnt to jump on these as they came along. You can find Cath and My Bearded Pigeon at her website, Etsy store or Instagram.